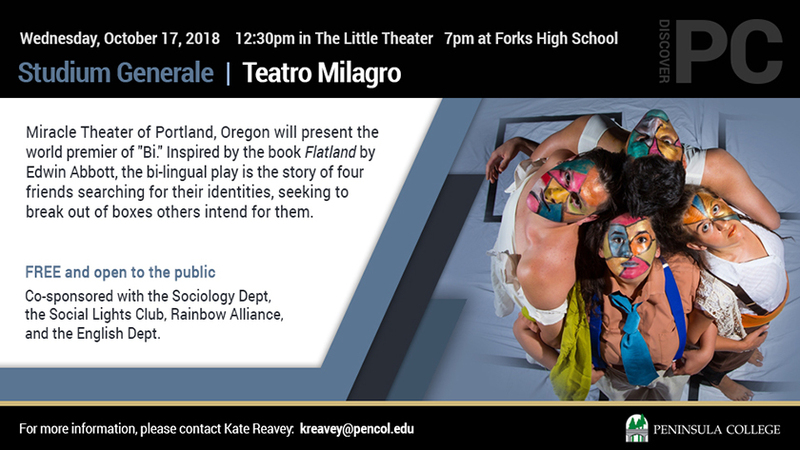 Teatro Milagro (Miracle Theater) of Portland, Oregon will return to the Olympic Peninsula, offering two performances of their newest production, titled "Bi,” which was written and directed by Georgina Escobar and choreographed by Gabriela Portuguez. The bi-lingual, Spanish/English theater group will offer a mid-day performance on October 17 at 12:30 pm in the Little Theater at Peninsula College’s Port Angeles campus, and an evening performance, at 7:00 pm in the Forks High School Commons in Forks. Inspired by the book Flatland by Edwin Abbot, “Bi” is the story four friends searching for their identities, seeking to break out of the boxes others intend for them. Dañel Malán co-founder of Milagro, researches script ideas, works with playwrights, directors, composers and choreographers and also designs and implements curriculum for K-12 schools, colleges, and community groups. Sequim High School English teacher Chelsea Reichner and Principal Shawn Langston are working together to bring more than 150 Sequim students to the mid-day performance, and Carrie Cobb, a Spanish teacher for Crescent School intends to bring her class as she does each year for the Teatro Milagro opportunity. Associate Dean of Athletics and Student Life at Peninsula College, Rick Ross, was the first to bring this group to the college in the late 1990s through the “Sound of Unity,” a student-funded program that brought world culture to the PC campus. Teatro Milagro later became a staple of the College’s Studium Generale program with a variety of performances spanning the last 10 years. The Miracle Theatre Group, founded in 1985, aims to provide “extraordinary Latino theatre, culture and arts education experiences for the enrichment of all communities,” according to the group’s website. The event is a true collaboration, as it was made possible through the Peninsula College Foundation’s “Exceptional Faculty Award” and partnerships with the Quillayute Valley School District (QVSD), Peninsula College Sociology Dept, the Social Lights Club, Rainbow Alliance, and the English Dept. For more information contact Dr. Kate Reavey kreavey@pencol.edu or Deborah Scannell dscannell@pencol.edu.